Welcome to the CWA Customer Service area of our Web site. The information found in this section is also available in a format that you can download at your convenience. You will need a copy of Adobe’s free “Acrobat Reader” software to view this pdf file. You can get a copy of the software at www.adobe.com. You may also view the PDF file online. At CWA, we know that our customers are busy and have full schedules. Therefore, we have adjusted CWA’s hours of business to suit your needs. Our Customer Service Department is open from 9:00 a.m. to 4:30 p.m. We are also available via telephone Monday through Friday, from 9:00 a.m. to 4:30 p.m. If you have an emergency, CWA representatives are available 24 hours a day, seven days a week at the emergency telephone number listed below. Our Customer Service Department is in our Main Office Building, which is located at 415 Welsh Street, in the City of Chester. 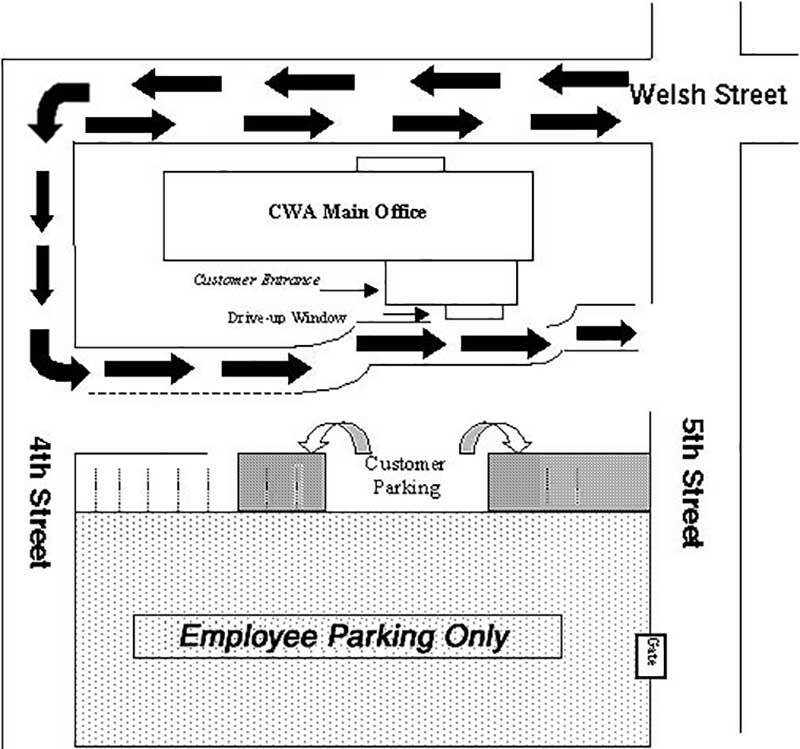 CWA has a drive-up window and convenient parking for customers at the rear of our Main Office Building. For easy drive-up access, please use the 4th Street entrance to the parking/drive-up area, as indicated by the diagram at the left. This entrance is also accessible to the handicapped. Click diagram to see larger version.